Since the previous Peanut Butter Quest Bar Cookies I made were such a hit, I thought I should get creative with the Cookies and Cream flavour. 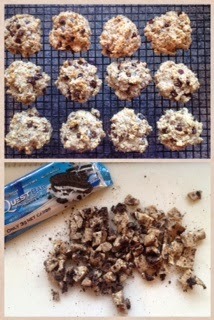 These might be hands down the best "healthy" cookie I have ever made! No kidding - it took major self control once these bad boys came out of the oven! Taste aside, they are made with wholesome ingredients and packed with protein and fibre. *If you wanted to omit the Quest bar, you could also add walnuts, extra chocolate chips, cranberries, etc. 1. Preheat oven to 350 degrees. Line a baking stone/tray with parchment paper. 2. In a large bowl mix together flour, baking soda, baking powder, salt, oats, and protein powder. 4. Add wet ingredients into the dry and mix. 5. Gently stir in Quest pieces and chocolate chips. 6. Drop cookie dough by spoonfuls onto parchment paper and with a fork slightly flatten each cookie. You should get 15 cookies. 7. Bake for 10 minutes, or until slightly browned. Let cool...EAT!